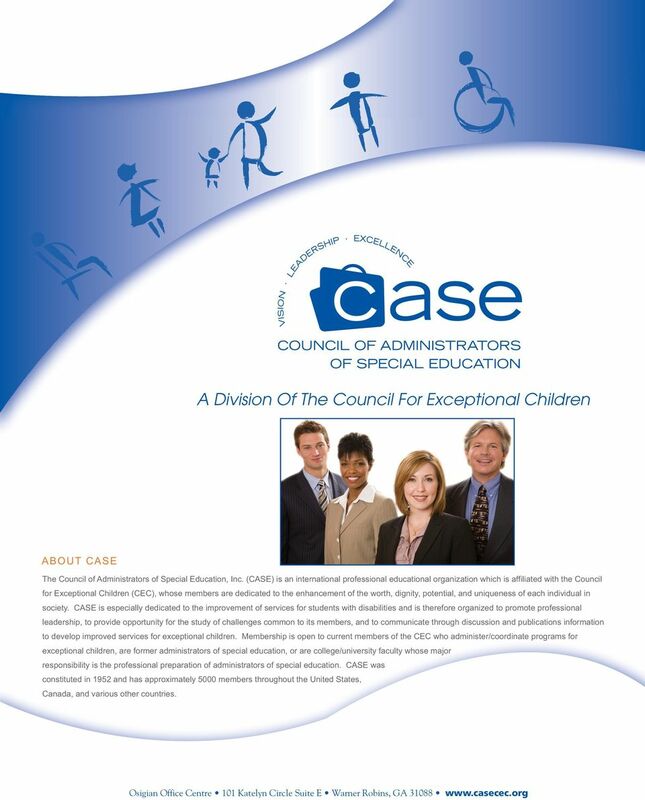 Download "CASE s ESEA REAUTHORIZATION RECOMMENDATIONS"
5 State and local district collaboration on administrator and teacher induction, retention, and mentoring programs that include professional development on Response to Intervention (RtI), Universal Design for Learning (UDL), and Positive Behavior Intervention and Support (PBIS). Development of special educator and administrative standards and criteria for performance-based compensation that includes differentiated options for student performance and outcomes. These differentiated options (multiple measures) may include but are not limited to: summative and formative assessment, educator observations, use of effective strategies linked to student needs, modified and alternate assessments based on the nature and severity of students disabilities, and progress monitoring and analysis of instructional plan effectiveness related to curricular growth. Local control in designing flexible performance-evaluation instruments to address the wide range of specialized roles and responsibilities of educators and administrators. These instruments may include such factors as: collaboration skills, shared accountability for student outcomes, additional education degrees and continuing education, application of progressive practices and strategies, diversity of students instructional needs, and varied educational settings. Funding for ongoing research to study the relationship between highly qualified administrator and educator status and improved student outcomes, and the relationship between differentiated compensation and student achievement. Increased federal support for pre-service and in-service training for school administrators that reflects the mandates for implementation of scientific, research-based strategies for increasing student performance as well as the increased demands for assessment and accountability. 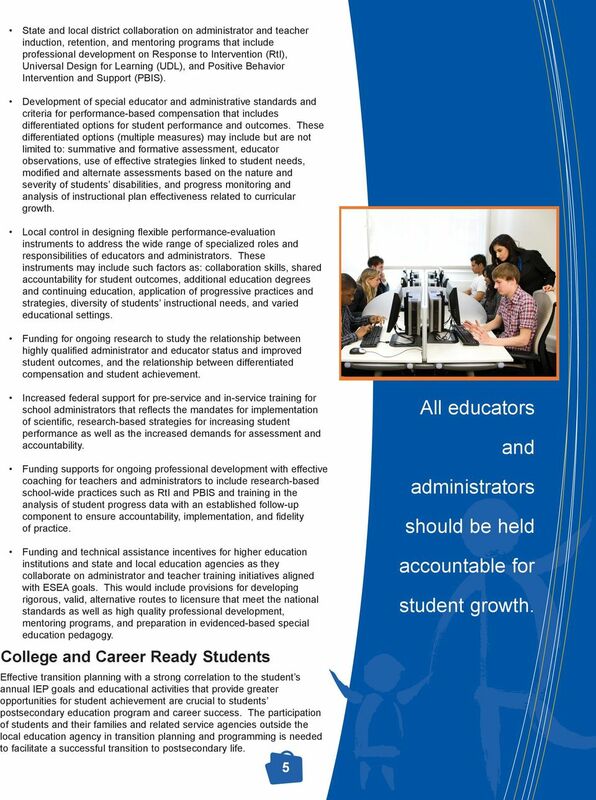 Funding supports for ongoing professional development with effective coaching for teachers and administrators to include research-based school-wide practices such as RtI and PBIS and training in the analysis of student progress data with an established follow-up component to ensure accountability, implementation, and fidelity of practice. Funding and technical assistance incentives for higher education institutions and state and local education agencies as they collaborate on administrator and teacher training initiatives aligned with ESEA goals. This would include provisions for developing rigorous, valid, alternative routes to licensure that meet the national standards as well as high quality professional development, mentoring programs, and preparation in evidenced-based special education pedagogy. College and Career Ready Students Effective transition planning with a strong correlation to the student s annual IEP goals and educational activities that provide greater opportunities for student achievement are crucial to students postsecondary education program and career success. The participation of students and their families and related service agencies outside the local education agency in transition planning and programming is needed to facilitate a successful transition to postsecondary life. 5 All educators and administrators should be held accountable for student growth. 7 The SEA must provide funds to charter schools in an equitable manner comparable to other public schools and be responsible for ensuring that state and federal requirements are met, unless state law assigns that responsibility to another agency. A charter school that is its own LEA must ensure that all requirements of IDEA are met, including the provision for a full continuum of services, unless state law assigns that responsibility to some other agency. 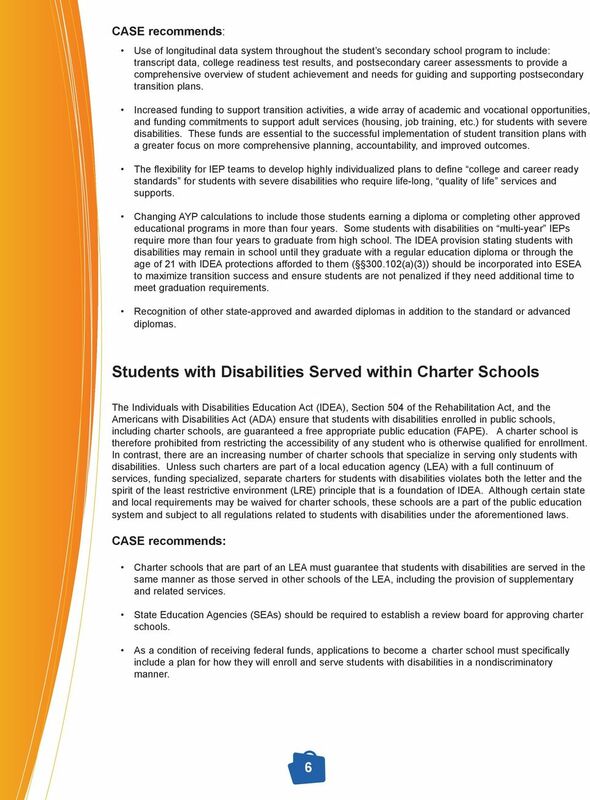 Technical assistance should be provided by the U. S. Department of Education and/or the SEA focusing on the needs of students with disabilities enrolled in charter schools. Funding and Resources for Effective Implementation of ESEA Reauthorization CASE greatly appreciates the significant funding for state and local school districts from the American Recovery and Reinvestment Act (ARRA) over the past year, allowing investments in new programs, improved technology, advanced data collection systems, and enhanced professional development programs that will continue to positively impact learning for all students. 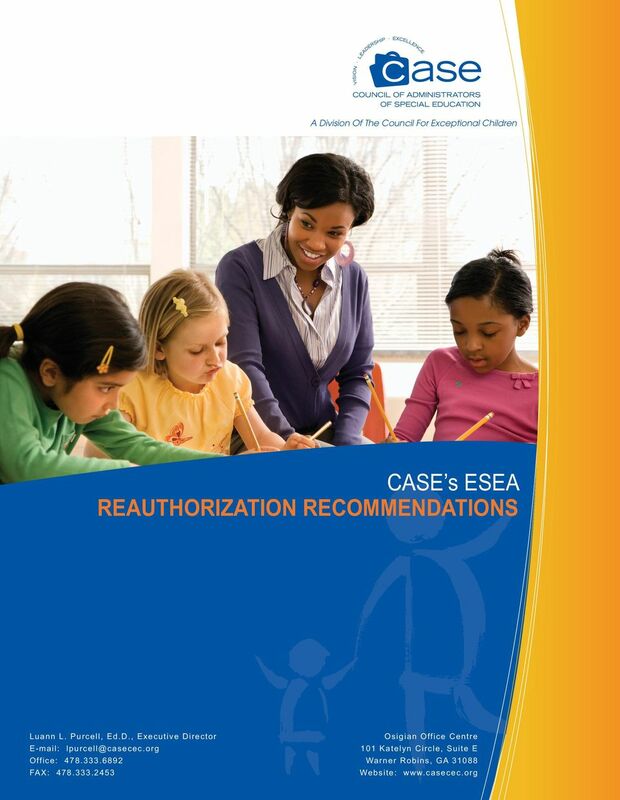 CASE recommends: Full ESEA funding at authorized levels. 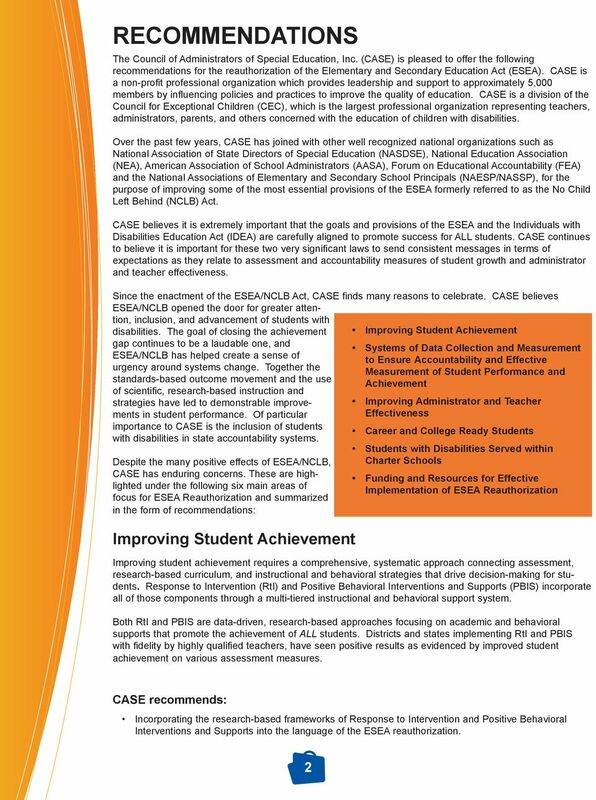 Federal commitment to financial resources and technical assistance to fully achieve the goals of ESEA will ensure states and districts can continue the important areas of effective implementation. It is evident that states and local districts cannot continue to assume the increasing burden of funding federal mandates given current severe budget reductions at the state and district levels. 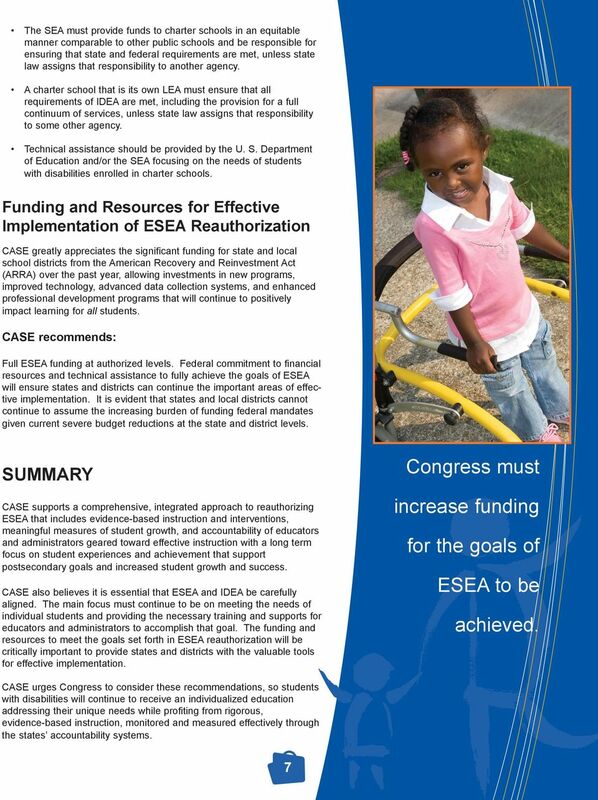 Congress must SUMMARY CASE supports a comprehensive, integrated approach to reauthorizing ESEA that includes evidence-based instruction and interventions, meaningful measures of student growth, and accountability of educators and administrators geared toward effective instruction with a long term focus on student experiences and achievement that support postsecondary goals and increased student growth and success. 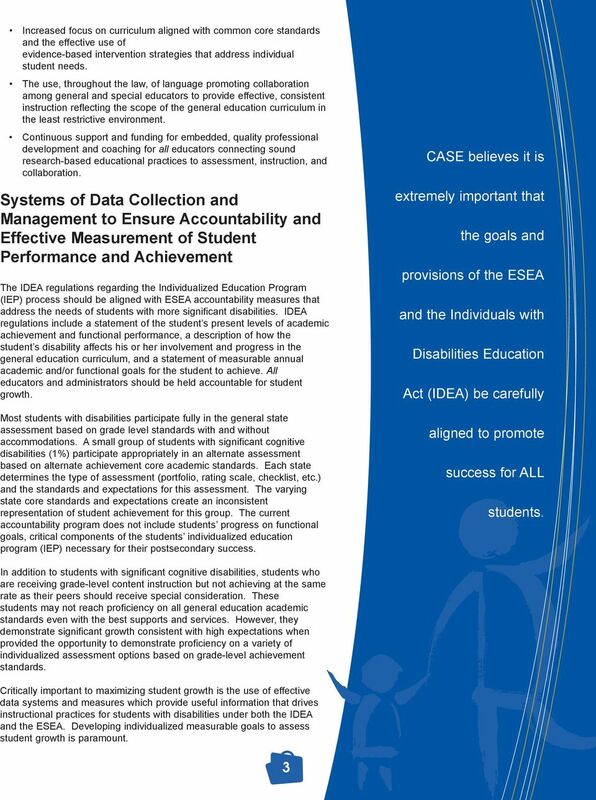 CASE also believes it is essential that ESEA and IDEA be carefully aligned. The main focus must continue to be on meeting the needs of individual students and providing the necessary training and supports for educators and administrators to accomplish that goal. The funding and resources to meet the goals set forth in ESEA reauthorization will be critically important to provide states and districts with the valuable tools for effective implementation. 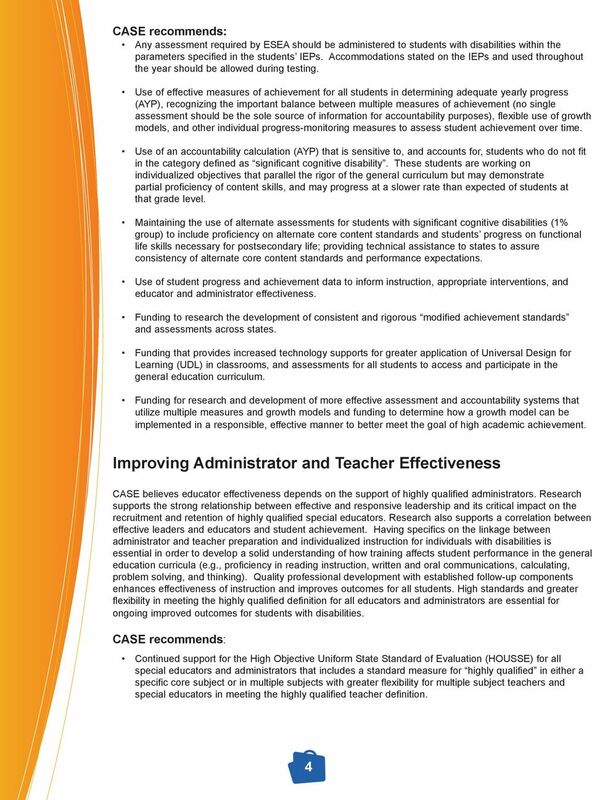 CASE urges Congress to consider these recommendations, so students with disabilities will continue to receive an individualized education addressing their unique needs while profiting from rigorous, evidence-based instruction, monitored and measured effectively through the states accountability systems. 7 increase funding for the goals of ESEA to be achieved.